This site will provide you with access to up-to-date information about the MMMS, affiliated societies, and microcopy resources sponsored by the society. The Midwest Society of Electron Microscopists (MSEM) was founded in 1957 with Dr. R. G. Picard of Central Scientific Co., Chicago as chairman. It was established by a reorganization of a group from the Illinois State Microscopical Society. MSEM affiliated with the Microscopy Society of America during the chairmanship of Dr. Stanley Weinreb, Marquette University, in 1958. It was incorporated in the state of Illinois in 1986 upon application of MSEM President Stephen D. Barnard, Merrill Dow Pharmaceuticals, Indianapolis. 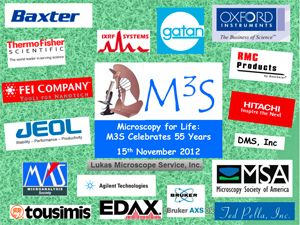 In 1996 the society changed its official name to Midwest Microscopy and Microanalysis Society under the chairmanship of Dr. Nestor J. Zaluzec. The objectives of MMMS are to advance scientific research and discovery through the use of microscopy and microanalysis, to provide a forum for the presentation and discussion of scientific problems and to interpret them for the common welfare.